Does Outbrain allow me to filter and exclude publishers? You have optimized your campaigns and narrowed in on the sections and publishers that have brought in the most engaged traffic. Now, it’s time to strategically exclude those that consume a majority of your budget but do not bring in a high return. Learn more in our walk-through video below. This is a powerful tool that can make or break the performance of your campaign. Blocking too many publishers or sources can cause a large enough decrease in traffic and halt your performance. We recommend blocking by section per campaign first to accurately monitor which sources are the least effective for your goals. Only block publishers on the account level as a last resort and only if the site is not driving results for any of your campaigns. 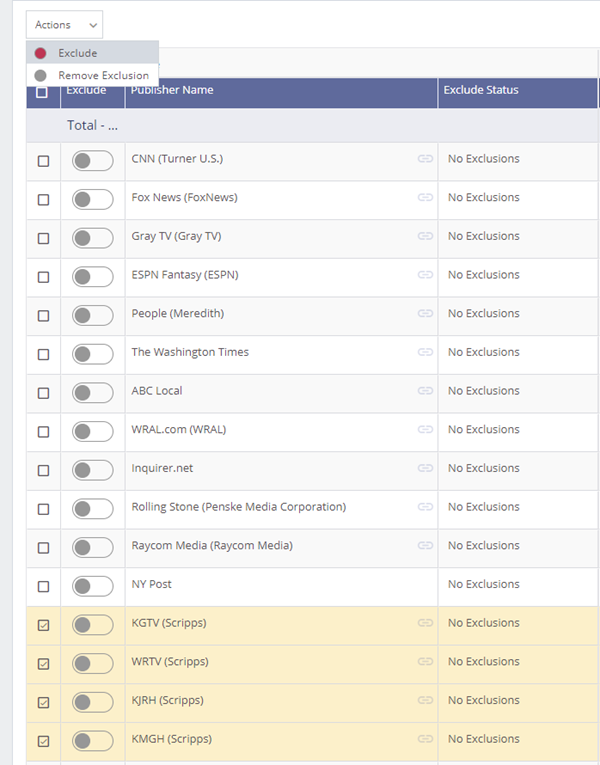 Using this tool will allow you to narrow in on Publishers and Sections by the campaign. or by the account as a whole or in bulk. Log in to your account and select “By Publisher” or “By Section” from the drop down menu. After adjusting the metrics and date range, a list of relevant publishers will be displayed beneath the data visualizer. Click the button next to the publisher name to exclude them from your entire account. 1) Click on the campaign name first and then select “By Publisher” or “By Section” from the drop-down menu. From here, you can see all of the publishers that have recommended your content for that specific campaign. 2) Open up the campaign’s settings by clicking on the pencil icon next to the campaign name. Enter the name of the publisher you want to remove in the “Exclude Publishers and Sections” box. 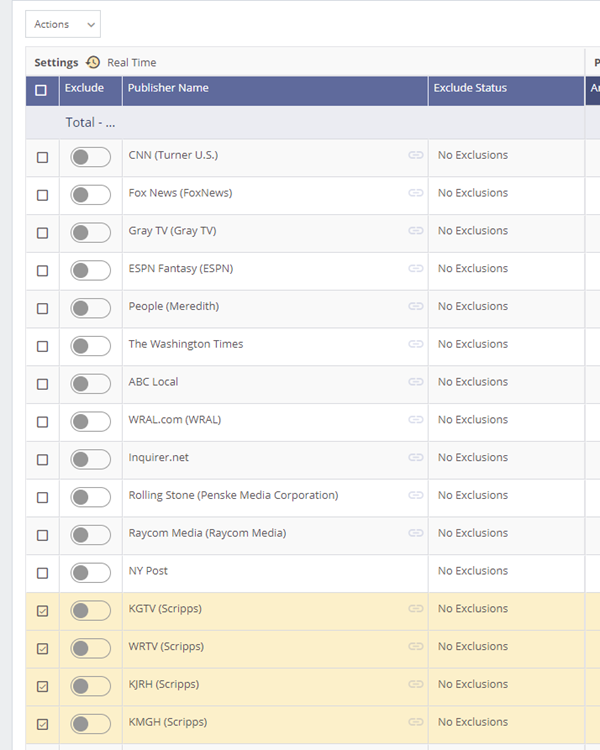 To exclude multiple publishers at once, select ‘By Publisher’ for a specific campaign or select All Campaigns for the exclusions to be account wide. Next select all the publishers you want to exclude by checking the box on the left. Next, click the Actions drop down in the upper left and select Exclude. This will exclude the selected Publishers. Please note that you can also use this method to exclude Sections in bulk by simply selecting the ‘By Section’ option under the drop down menu. If you run into any errors or have questions about this feature, feel free to reach out to our support team and we’ll be happy to guide you along. You can also read more on how to integrate your Outbrain data with Google Analytics, to gain deeper insight into your content strategy efforts. A publisher will show as partially excluded if certain campaigns have excluded it or certain sections are removed. Excluding too many publishers/sections may limit your potential reach and have a negative impact on your performance. If you choose to block a top performing publisher, we recommend increasing your CPC to compensate for the loss source of traffic. You can also make bulk section exclusions by using the ‘Import’ option. First export your campaign-specified “By Section” report in the dashboard to find the Section IDs for the sections you want to exclude. Create a CSV file of those Section IDs you would like to exclude. When complete, click the Excludes option under the Import button in the upper right. What audience targeting options are available to me? How do I use the advanced audience targeting options? How do I optimize for conversions? How can I scale my campaigns? How can I drive clicks to all of my headlines? How can I set up and track Multiple Conversions? How do I create Custom Audiences? How do I create a Lookalike Audience? Can I import my own audience lists into Outbrain? Why am I not receiving conversions? Copyright © 2019 Outbrain Inc. All rights reserved. Outbrain is a trademark of Outbrain Inc.